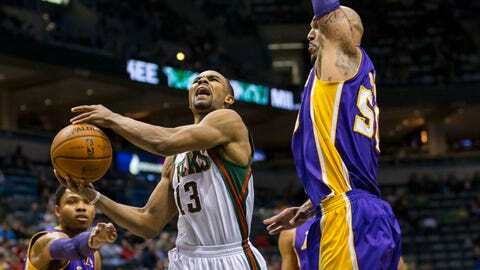 Bucks guard Ramon Sessions got to the line 14 times and hit 11 free throws en route to a 22-point night in Milwaukee's 108-105 win over the Lakers. MILWAUKEE — Larry Drew wanted to make a conscious effort to run more pick-and-roll offense Thursday night against the Los Angeles Lakers, and the Milwaukee Bucks certainly did just that. 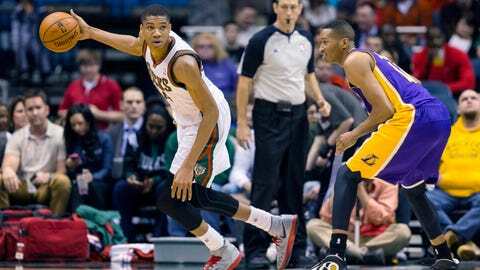 Milwaukee’s backcourt duo of Brandon Knight and Ramon Sessions carved up the Lakers off the pick-and-roll by getting to the basket all night long, combining for 52 points in a 108-105 victory at the BMO Harris Bradley Center. The Bucks completed the two-game season sweep of the Lakers for the first time since 2006-07, as two of their three wins (3-27) against the Western Conference have come over Los Angeles. "I wanted to utilize both of those guys and their speed and their quickness," Drew said of Sessions and Knight. "Both of them really have the ability to get to the basket. We made a couple of bad decisions in the paint but for the most part I thought, for the pick-and-roll game, we did a pretty good job. "Ramon has an uncanny ability to draw fouls and get to the free throw line. Brandon’s more of a surveyor who’ll either take the shot or take the drive. I thought they both did a good job." Knight and Sessions both acknowledged the increased use of the pick-and-roll and said the Lakers big men were retreating toward the basket, making it easier to get to the hoop. "We did a good job of putting them on their heels," Knight said. "We were getting good stuff out of it all night long, so we wanted to stick with it." The two guards shot a combined 17-of-31 from the field and hit 15-of-20 free throws. Sessions got to the line 14 times and hit 11 free throws en route to a 22-point night. After scoring a career-high 37 points against the Lakers in Los Angeles, Knight finished with 30 points Thursday. "He’s had a great year, you can’t take nothing away from him," Lakers guard Kendall Marshall said of Knight. "He does a great job in the pick-and-roll and taking our bigs. They do a great job of spreading us out. It’s hard to guard a player that strong for a big man when he’s coming full speed at you. He’s taken advantage of that in both games." Drew wanted to run more pick-and-roll offense to utilize the ability Knight and Sessions have to get to the basket but also wanted to open up the floor. The Bucks were able to accomplish just that as they shot 55.7 percent from the field and made 6-of-10 from beyond the arc. Milwaukee only had 15 assists on 39 made field goals, but Sessions took that as a sign of how the Bucks were able to get to the basket. "It’s tough to guard," Sessions said. "If you move the ball from one side, you still have that same kind of penetration coming at you from the other side. "At the end of the day, we know that’s our bread and butter. We have guys setting good screens. We just penetrated and were able to create, get to the foul line and score baskets." Giannis goes down: The entire BMO Harris Bradley Center held their collective breath when Giannis Antetokounmpo rolled around on the floor in pain after coming down on Lakers guard Nick Young’s foot in the fourth quarter. Milwaukee has dealt with injury after injury this season, but one to its rookie sensation would have been a tough pill to swallow. It appears as if Antetokounmpo dodged a bullet, as X-rays were negative and revealed just a sprained right ankle. Antetokounmpo says he’s never had a sprained ankle before in his life. "I don’t really have experience with this because I’ve never got injured before," Antetokounmpo said. "I’m going to put a little bit of ice on it, get a little treatment and see how I feel tomorrow. "It was weird, but it is what it is. I hope I get better, it already feels better. I’ll be back soon." Driving to the basket with 7:14 left in the game, Antetokounmpo was called for an offensive foul on the play. He stayed down for a few seconds but eventually was helped up by his teammates. Zaza Pachulia and Larry Sanders tried to help the rookie off the court, but he walked to the locker room under his own power. "They are my teammates and just want to help me, but I’m not thinking about that," Antetokounmpo said. "I just wanted to go back and see how it is. "I don’t know where I stepped on that play, but I felt my ankle turn." Antetokounmpo, who finished with 10 points and seven rebounds in 25 minutes, was the only perimeter player to play off the bench Thursday. With Nate Wolters out for the season and O.J. Mayo sidelined with a sprained ankle, only Antetokounmpo and the recently signed D.J. Stephens were the only two reserves capable of playing guard. "Hopefully O.J. will be ready to play on Saturday," Drew said. "If he’s not ready to play and Giannis isn’t ready to play, we’re down to one perimeter on the bench and that’s the kid we just signed to the 10-day contract."